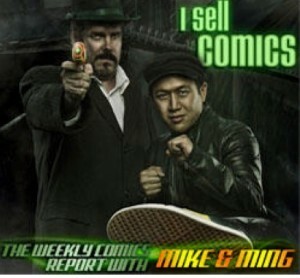 I Sell Comics is a podcast that shouldn’t work. It has two guys on it who’d be the first to admit that they’re not wordsmiths or polished presenters. There’s enough background noise at times to rival a busy supermarket. There’s pauses, long tangents and guests with awkwardly delayed introductions. Hell, there’s even a lot of cliquey / boy’s club stuff that should alienate a whole bunch of people. But I love this podcast. I Sell Comics works well for a very obvious and powerful reason: anyone that’s watched more than a couple episodes of Comic Book Men will feel like they know these two guys. They’re the more passive of the four on the TV show (or at least their show personas are) and their likeability translates well to the podcast. Mike Zapcic’s knowledge of pop culture from the ’70s to now is the glue that holds things together, although Ming Chen’s self-effacing manner doesn’t hurt either. I’ve mentioned the weaknesses of the podcast in the first paragraph, but after listening to a whole bunch of episodes those issues are still endearing rather than grating. My only real concern is that after nearly 160 episodes the casual chat we witness could merge into a ‘going through the motions’ exercise. Some have argued that point has already been reached but for mine the line hasn’t been crossed and hopefully won’t be. As a podcaster myself I tend to be forgiving of production issues given the amount I’m responsible for myself. Even taking that into account, the idiosyncrasies of I Sell Comics are more often than not beneficial. If you’re a fan of the TV show then go have a listen. If you haven’t seen Comic Book Men then there’s probably still enough in each show to keep you engaged although a fair proportion of the chat may not make as much sense. * Disclosure: I may or may not have emailed The Secret Stash pitching that I be allowed to open a Secret Stash Oz. For some reason I’ve received no reply – who’d have thought?? I Was Cynical About Secrets Wars and Battleworld Until..
We Hate People Episode 7: We Are Tight But Whole on I Was Cynical About Secrets Wars and Battleworld Until..